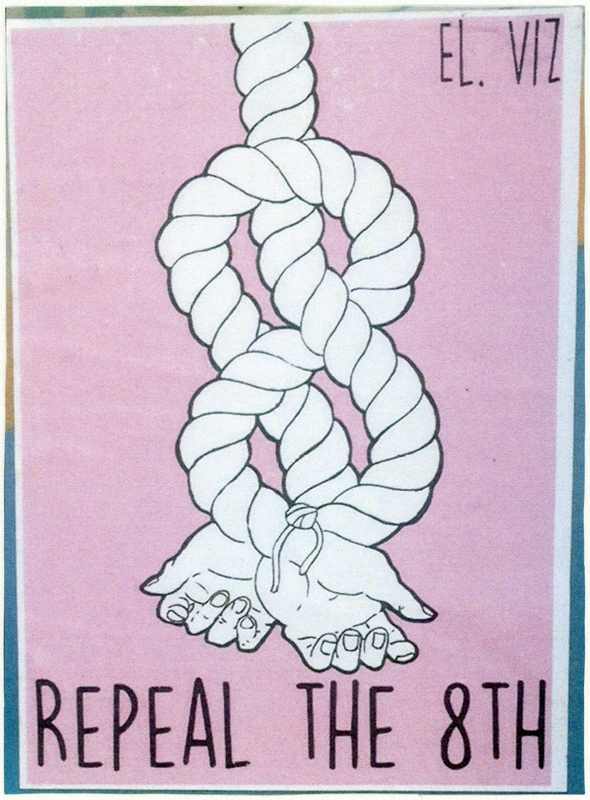 Commenting upon abortion rights in Ireland, this sticker features a twisted rope in the shape of the number 8 binding a pair of wrists. Underneath are the words “REPEAL THE 8TH” in a thin black font, and “El. Viz” is written in the upper right corner. Since 1983, receiving an abortion anywhere in Ireland, including both the Republic and Northern Ireland, is illegal unless the pregnancy threatens the mental or physical health of the mother. The Eighth Amendment of the Constitution is the piece of legislature that equates the right to life of the unborn fetus with the right to life of the mother, making abortion unlawful. A referendum to repeal the Eighth Amendment is scheduled for May 2018. El. Viz is the Irish artist who designed and produced these stickers. In July 2016, he started mailing them for free to those interested in supporting the repeal campaign. In January 2017, he also began selling “Repeal the 8th” badges of differing designs; all proceeds from sales were donated to Ireland’s Abortion Rights Campaign.